The screen on Google’s Pixel 2 XL is taking a hammering. First, users noticed how its weird color-shift effect made it look excessively blue when viewed off axis. Then, they saw how the device’s default settings can make images look dull and dreary. But the latest issue with the Pixel 2 XL’s POLED screen may be the worst yet. After only about a week, several users have reported seeing the effects of screen burn-in on Google’s latest high-end phone. Burn-in is when certain visual elements, often parts of the UI like the navigation bar, become permanently discolored so that even when you’re looking at something else, you can still see the remnants of previous visuals—or what is known as a ghost image. It’s an issue that plagues many types of displays, from modern OLEDs to plasma screens and even old-fashioned CRTs, and was the original reason why people invented screen savers. However, typically, it takes years or at least months to see the effects of burn-in, which is what makes these reports so troubling. Google seems to be aware of the issue, and based on a comment the company issued to The Verge, Google says it is “actively investigating” users’ reports. 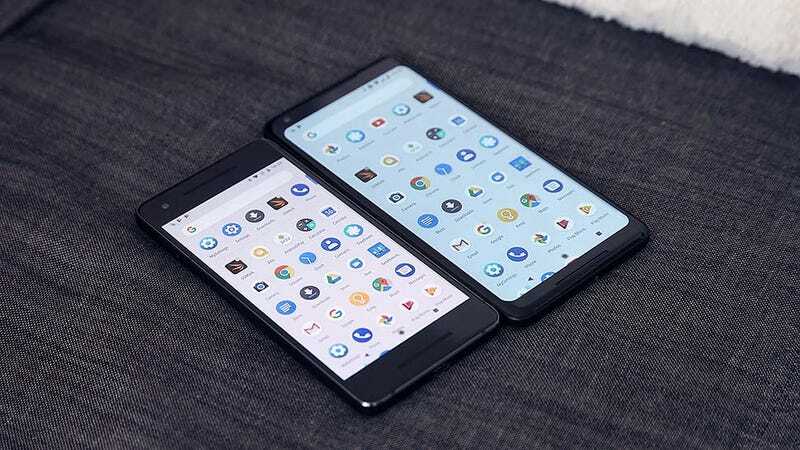 For the time being, these reports only cite the Pixel 2 XL and its POLED (passive-matrix OLED) screen, as the smaller Pixel 2 features a different, AMOLED display. There’s a chance that these reports could be caused by another display issue called screen retention, in which faulty software can cause lingering images that don’t permanently affect the screen. However, reports like the one above, from Android Central executive editor Alex Dobie, seem like classic case of burn in. It’s possible that the screen itself is the root of the problem. While some display manufacturers like Samsung have figured out how to largely eliminate burn-in on its latest Galaxy phones with super AMOLED displays, LG, which is responsible for the screen on the Pixel 2 XL, has had issues with its POLED screens on other recent phones such as the LG V30. We haven’t encountered these issues on our review unit, but this is still a pretty big deal. A phone’s screen is the primary way we interact with the device, and for something that starts at $850, there’s no good reason why issues like burn-in should be cropping up this soon, not to mention all the other problems with the screen.